Can’t fall asleep? A book should do the trick! Sleep is your body’s way of recharging itself. Your body is in physiological heaven when you sleep, replenishing and rejuvenating itself for the work up ahead. The effects of a lack of good night’s sleep will be clearly visible on your face the next day. 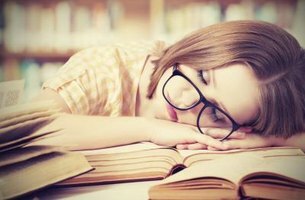 With an increasing number of people suffering from insomnia, several treatments have been suggested over the past several decades. These have been both chemical and psychological, and the long term effects are rather dubious. What if we told you that there was a simple, safe and non-intrusive way of curing sleeplessness? Reading! If you’re in need of a reading or grammar tutor, check out what we have to offer at HeyKiki! The abstruse books: These are the books that you have a hard time comprehending even when you are wide awake. Pick up a copy of your old Mathematics for Advanced Learners or Quantum Physics for Science Majors and feel yourself gently drifting off to la-la land in no time. When in doubt, pick up the most unimaginatively named book in the shelf and nine times out of ten, it will be the most cryptic book in the lot. The sibylline books: Who knew that reading about the answers to the mysteries of life (or lack thereof) could be so relaxing that it automatically brings your metabolic rate down? The next time you find yourself too wound up to fall asleep, try reading that fat leather bound philosophical volume that has been gathering dust for a while now. The classical books: No, we are not talking about The Scarlet Pimpernel or Great Expectations; not even about the plays of Shakespeare. Think Chaucer and his Canterbury Tales, and you will be magically transported to a place where people used words like ‘chivalrie’ and ‘worthynesse’ in the normal course of a conversation. It’s important to note, however, that you should always choose a hard, physical copy of a book if you’re trying to fall asleep. Studies have consistently shown that reading off digital screens before going to bed actually makes it harder to fall asleep. A Business Insider article explains that the specific wavelengths of the screen mess with your circadian rhythms, which are essential for sleep. Using laptops, smartphones, iPads, and the likes right before bed has also been shown to make you less alert the next day. So, put the cell phone down and pick up that old dusty book. If you’re interested in finding a reliable English tutor, you’ve come to the right place. HeyKiki is an educational source that compares hundreds of tutors based on effectiveness, reliability, and experience. Find a teacher in your neighborhood today.